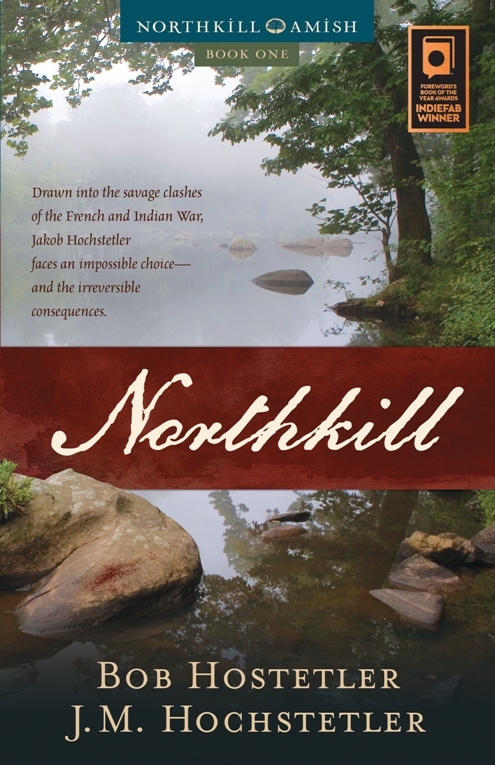 In writing The Return, book 2 of my Northkill Amish Series coauthored with bestselling author Bob Hostetler, which is set during the French and Indian War, I’ve done considerable research on the religious beliefs and practices of the Native American tribes that appear in the story. The Seneca, the westernmost tribe of the Iroquois Confederacy, held my ancestor Jacob Hochstetler captive from the fall of 1757 to May 1758, when he managed to escape. And today we’re going to take a look at their major religious festivals. I found much of this information in a very well-researched 5th grade textbook titled The Magic Moccasins by Jane Barks Ross, copyright 1985, now out of print. Like the other tribes of the Iroquis Confederacy, the Seneca observed the following six major ceremonial festivals during the year to give thanks to Nauwaneu, the Master of Life. The Maple Festival, in which they gave thanks to the maple trees for yielding their sweet waters, and to the Master of Life for the gift of the maple. The Planting Festival, when they invoke the Master of Life to bless the seeds and cause the rain to fall and the plants to grow. The Strawberry Festival, a thanksgiving for the first fruit of the season. The Green Corn Festival to give thanks for the ripening of the harvest. The Harvest Festival, which is a general thanksgiving to the Master of Life for the abundance of the harvest. The Midwinter or White Dog Ceremony. The White Dog Ceremony was the Seneca’s most important (and most interesting) festival. It was celebrated at the time of the new moon at the end of January or first of February to inaugurate the beginning of their new year by making a sacrifice for sins. It was believed that this would help the Master of Life bring back the spring and keep his evil brother from obstructing him. Ten to 20 young men formed a committee to oversee the preparations and performance of the ceremonial. On the first day, 1 or 2 white dogs or those with the fewest spots—or sometimes a person held captive—were strangled near the door of the council house. (The Iroquois who still celebrate this festival today use a white basket.) They were careful to not make a wound or spill any blood. The dogs’ faces, the edges of their ears, and various parts of their bodies were then painted red, and after they were elegantly decorated with colored ribbons, feathers, and other ornaments, they were hung on posts outside the council house doors. The young committeemen now raced around the town, wearing only breechcloths and beating paddles on the houses to drive the occupants out. After they left, the youths went inside, scraped up the ashes of the old fire with their paddles, and threw them into the air, scattering them throughout the house. After kindling new fires with a flint, they fired 2 shots with their guns as they went out. The next 2 or 3 days found the committeemen dancing and running through the town with bearskins wrapped around their legs, firing their guns and running tortoise-shell rattles across the walls of the houses. Each carried a basket and demanded from the townspeople tobacco and other items to use for incense at the sacrifice. Ceremonial dances were held in which all the townspeople participated. 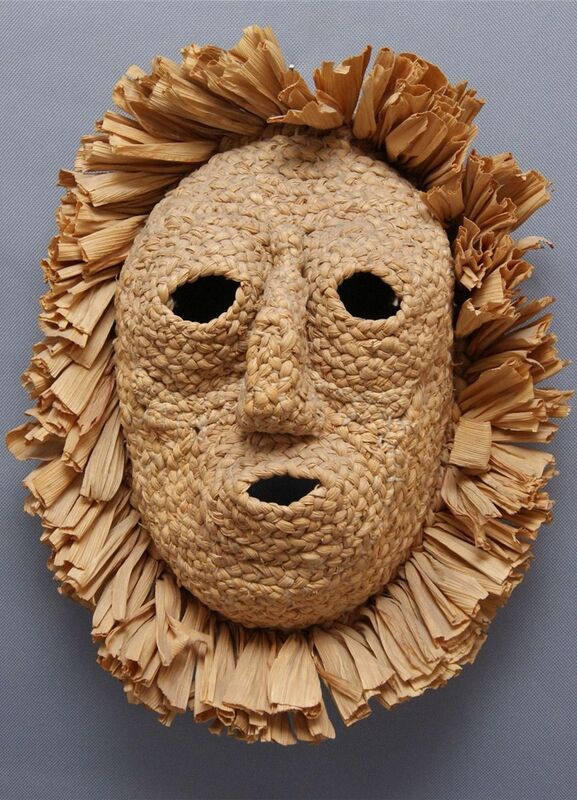 On the festival’s 4th or 5th day the young men wore fearsome faces of woven corn husks in addition to their bearskins. They ran around the town, smearing dirt on themselves and on anyone who hadn’t given any incense. In this way they drove off the evil spirit and gathered into themselves all the sins of the tribe. On the 8th or 9th day the committeemen took the white dogs down from the poles and by a form of magic worked the sins of the tribe from their bodies into the dogs, which were then placed on a pile of wood. While they were burned, the people threw the gathered incense onto the fire so the scent would rise on the smoke to Nauwaneu and please him. The chiefs conferred on the affairs of their nation throughout the 9 days of the festival and planned for the future. 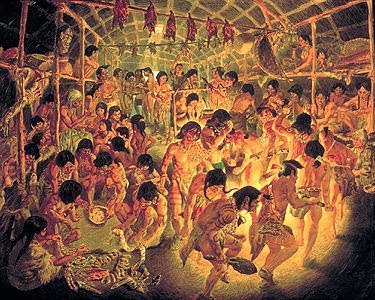 On the final day everyone feasted on meat, corn, and beans cooked together in large kettles. Then the war dance was performed, followed by the peace dance. After the people smoked the peace pipe, they returned to their homes feeling that they had been cleansed from their sins to start the new year. Some of these customs may seem outlandish to us today, but they held great meaning to the Seneca as the means of making atonement for their sins. Their religionincluded some beliefs and practices that helped to open the hearts of many of the native peoples to the preaching of the Gospel. 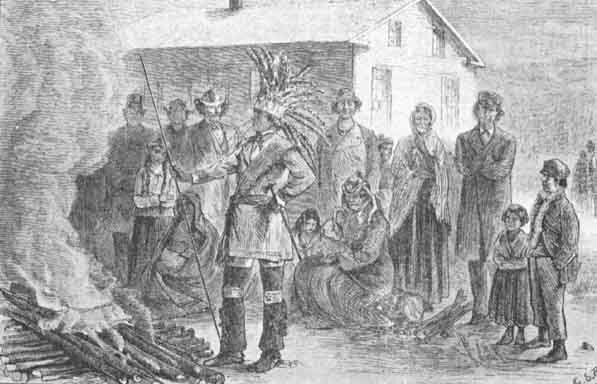 In next month’s post I’ll describe the festivals of the Lenape, or Delaware tribe, whose religious beliefs made this tribe especially fertile ground for the ministry of Moravian and other Christian missionaries. What religious festivals are particularly meaningful to you? Please share how they help you to worship and draw closer to God. The above images can be found at http://www.rootsweb.ancestry.com/~nyononda/ONT/HISTORYBR.HTM; http://www.icollector.com/IROQUOIS-CORNHUSK-MASK_i12961023; and http://aboutnativeamericans.blogspot.com/2013/11/historic-description-of-seneca-iroquois.html. I know, Chappydebbie! Today we find the use of dogs or prisoners horrifying, but theirs was a warrior society, and they didn't have the sensibilities we have today. Thankfully that practice changed, and today they use a decorated white basket. Much more humane! Oh, isn't that the truth, Connie! I like to think humankind has progressed since then, and in may ways it has, praise God. Unfortunately, modern-day history still includes many examples of cruelty and outright evil. We humans will always stand in need of redemption.